We love trying new recipes. Especially when they go as well as this vegan burrito. A part of it even came about by accident, but more on that later. 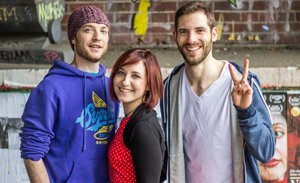 If you’re on this page, there’s a good chance you know exactly how great vegan food can be. Some still have their doubts – and that’s fine – we’re here to change things. On the filled wrap side of things, we’re growing quite a repertoire. Not quite as big as our curry selection, but we’re getting there. and Chickpea Wraps (food really doesn’t get much easier). Each and every one of those recipes holds a place in our hearts (I told you, we love food! ), but when a friend asked me for a vegan burrito recipe I was genuinely surprised to see we didn’t already have one on the blog. I could have sworn we did. Sure, all of the recipes above can be made vegan if wanted, but we realised we needed a real, ‘pure’ vegan burrito recipe. Burritos are a pet love of ours, and we were very much up to the challenge of adding a vegan burrito to the roster. Smoked tofu is our go-to for this recipe – it’s quick to cook, easily accessible and packed with vegan protein. In fact, it’s also a ‘complete’ protein – something that is invaluable to vegans and vegetarians. 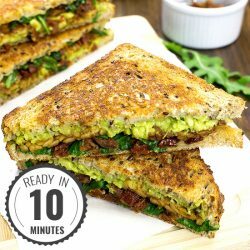 Most plant-based proteins are not ‘complete’. This means that the protein does not include all of the essential amino acids (and we need them all, hence the name ‘essential’). Because of this, vegans and often vegetarians usually need to mix their protein sources together. This ensures they get each of those essential acids. It doesn’t necessarily have to be in the same meal, but within a 24 hour period, as a general rule. Apart from a few exceptions, ‘complete’ proteins are usually limited to animal sources. Tofu is one of those exceptions. Quinoa is another. If you would like to know more about protein (and get a free veggie high-protein meal plan) then please go here. Yes, as we were prepping the burritos for photoshooting, something strange happened. Well, not strange exactly, but something that made us think. 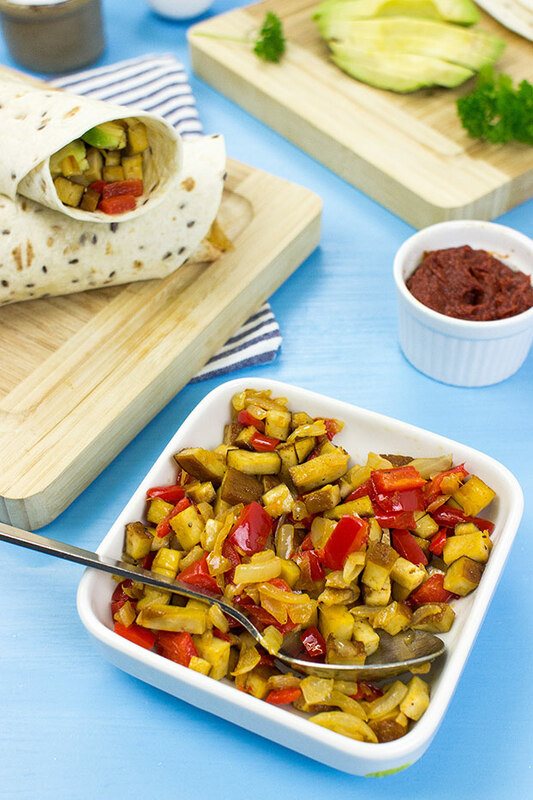 Served inside this vegan burrito is a lovely tomato-based sauce. 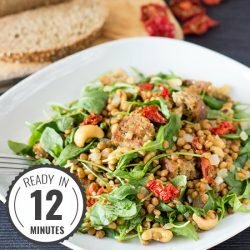 It’s quick, easy and very tasty. But what happens if you leave a wet sauce inside a soft wrap? You guessed it – the wrap falls to pieces. 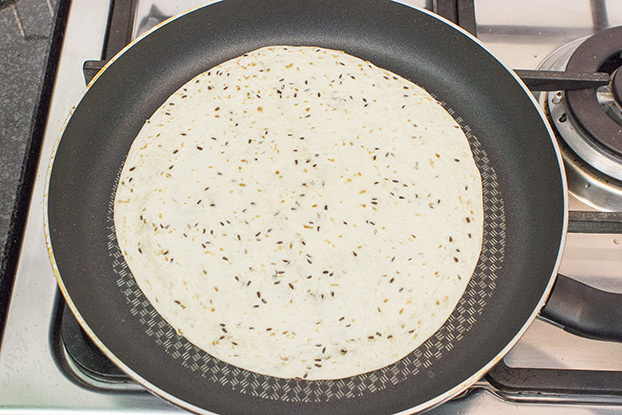 By itself this isn’t a problem – the wrap will be eaten before it goes soggy. 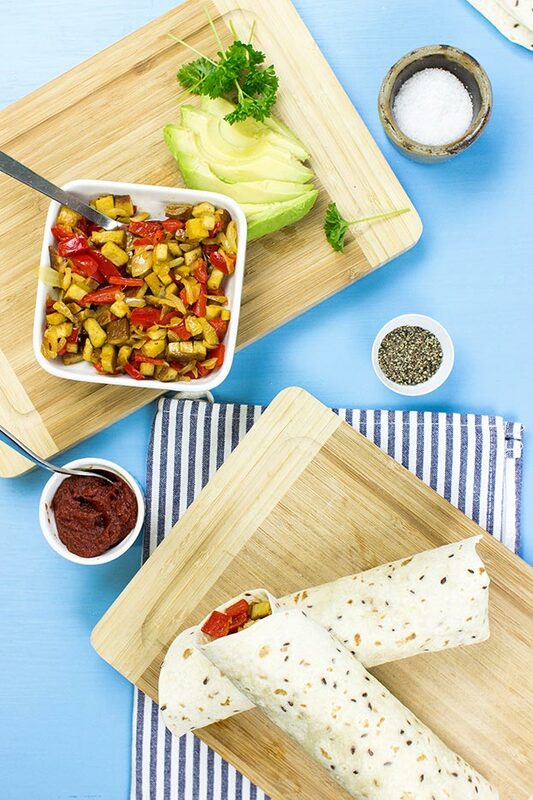 But for the photos (which can take a while) we wanted, fresh, tasty looking wraps. Our solution to the problem was to use tomato paste (the thick stuff in a tube) instead of the tomato sauce. And you know what? It was delicious. The concentrated taste from the paste complemented the tofu-pepper-onion mix so well! It also saves time – you literally spread it on with a knife and you’re good to go. 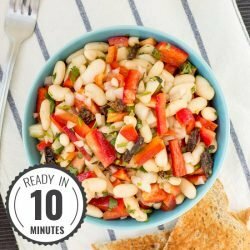 So if time is of the essence and you want to speed up an already quick meal, then just use the paste. 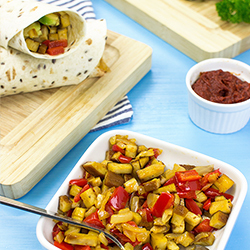 However you’re going to eat your vegan burrito – guten Appetit! If you like it spicy then mix some tabasco or sriracha into the tinned tomatoes. You could add some soy yogurt to serve. Extra herbs – coriander or parsley mixed in with the tofu and onion at the end of cooking is really nice. 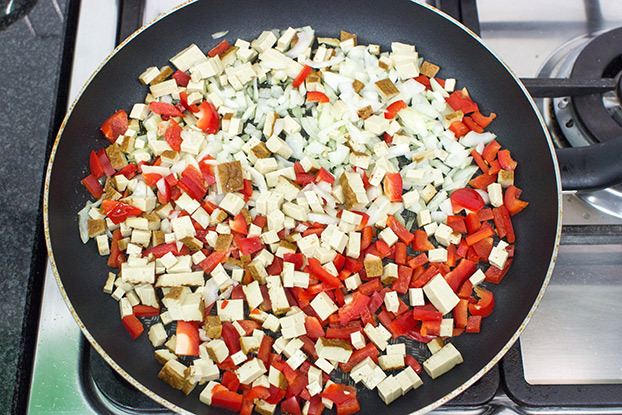 Chop the tofu into tiny squares. Dice the onion and the bell pepper. 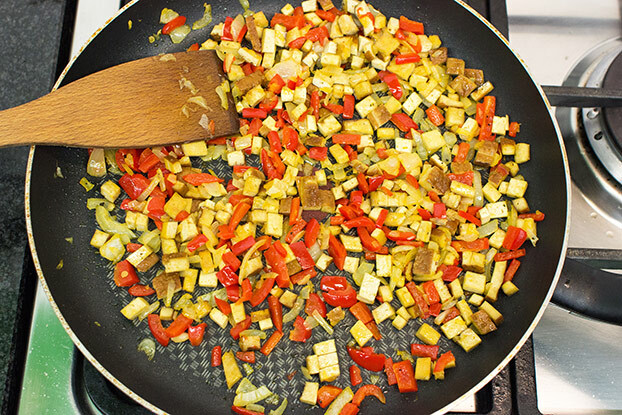 Heat up the olive oil and fry the tofu, onion and pepper on a low-medium heat for about fifteen minutes. Scoop the flesh out of the avocado. Mix some salt and pepper into the tinned tomatoes. If using, add a little spicy sauce. 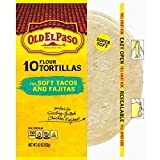 When the tofu-mix is ready, heat up some tortilla wraps (twenty seconds on each side in a hot pan should do it, alternatively microwave). 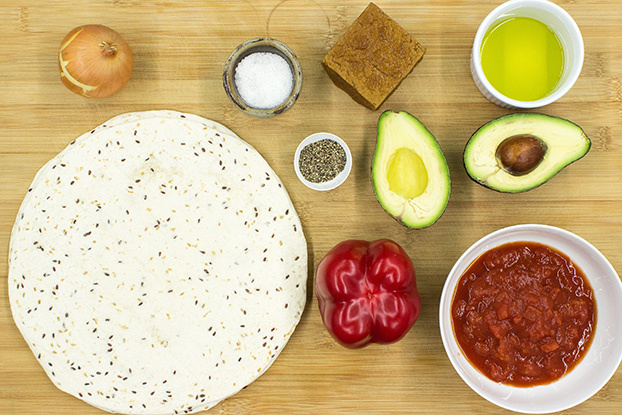 If using tomato paste, spread a tbsp over each wrap. Lay out the tofu-mix down the middle of each wrap. Then make a line of tinned tomato (if using), and another of avocado. Fold the bottom up slightly first, then each side and wrap tightly. Nothing should be able to escape out the bottom. Serve with a little soy yogurt if wanted. 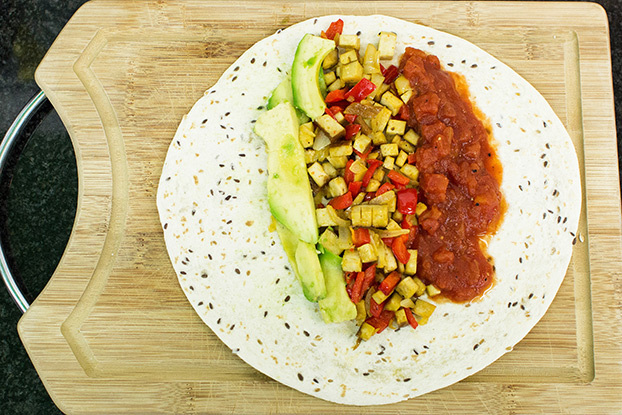 Voilà, your vegan burritos are ready! Nutritional information is for one filled wrap.